Berdick and partnering suppliers team up to create incredibly beautiful and energy efficient entrance systems. These doors provide years of low-maintenance, worry-free security and satisfaction. 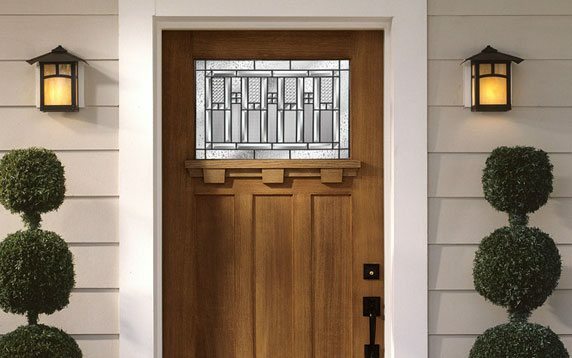 Timeless elegance is yours with insulated steel and fiberglass doors from Berdick. With so many models to choose from it is easy to find the right door to accent the distinctive character of your home for years to come. Steel panels with a nominal thickness of .21 are hot dipped galvanized with a corrosion resistant zinc coating and finished in an electro-statically applied high quality powder paint. The doors have a full 16″ lock block to provide strength at the lockset plus added security. The door’s edges are roll formed to firmly fit into the diagonal grooves in the wood styles, creating an even stronger door. Injected polyurethane foam bonds & insulates the door forming a solid composite door panel. Foam density averages 2.0 lbs /cu.ft. Pre-hung doors come complete with nylon jacketed compression weather-strip and multi fin door sweep designed to withstand our Canadian winters. Heavy duty thermal broken aluminum clad sills and wide double bead brickmould are standard. Inswing, outswing and custom heights are available in a variety of different glazing options. Square-edge design gives the appearance of a solid wood door; and permits easy field trimming. High quality sweep seals out the elements. No more drafts or leaks. Textured woodgrain fibreglass surface for easy staining. All fibreglass doors are available factory finished in 4 stained or 8 painted colours. Fibreglass doors may also be ordered unfinished to allow custom finishing on site. Lifetime limited warranty against warping, cracking and de-lamination.